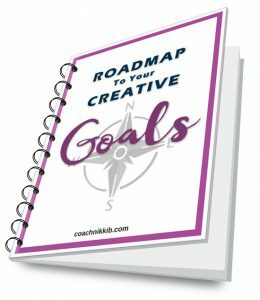 Goals Journal Opt-In | Coach Nikki B. Feeling stuck in a creative rut? 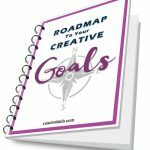 Claim Your Free Roadmap to Your Creative Goals now. Simply enter your name, email address and click ‘Sign Me Up!’ below. Setting and working towards well thought out goals helps you stay laser focused on what’s most important to you and helps you become more productive and efficient in all areas of your life. And did you know? Goals can even help you be more self-confident and enthusiastic about your writing. Setting goals sounds easy. In fact, it sounds so easy that most people just don’t recognize the power behind it. On top of that, most people set goals based on short term thinking. They view goals as a way to move out of the chaos they are in instead of moving toward their bigger vision of success. And of course, with all the distractions of everyday life, it is SO easy to lose track of what we are doing and eventually forget our goals altogether. Does any of that sound familiar? If you are having trouble setting goals or if your daily actions are not moving you closer to accomplishing them, then isn’t it time to make some changes? Here’s a great tool to get you moving in the right direction.. Your privacy is protected and your email address will only be used by Nikki Brown to communicate with you about topics to help you be successful with your creative work.. No worries. 🙂 You can easily cancel your subscription at any time.